Info: The Junior fairytale Tower is a maintenance free playtower system. The side panels and pelmets are made from high strength recycled multi -layered plastic. The commercial slide has extra high sides for additional safety. 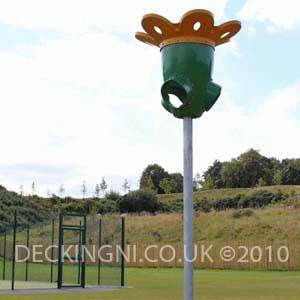 The Play tower is secured using galvanised steel anchors concreted into the ground. Info: The School Tower is a fairly low maintenance multi activity play tower system.. The access ramp and floor of the tower are made from low maintenance Deck25 plastic composite. 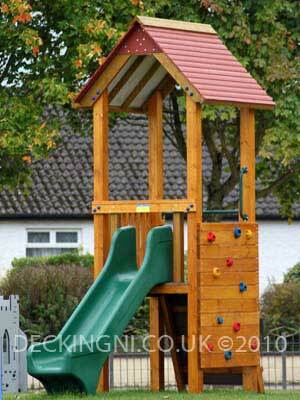 All wooden components are protected using our 4 stage coating system. The commercial slide has extra high sides for additional safety. The Play tower is secured using galvanised steel anchors concreted into the ground. Info: The birds Nest Swing is one of the most popular items in the public park or playground. It is also a valuable piece of equipment in autistic centres and special needs schools. Info: The birds Nest swing is one of the most popular items in the public park or playground. It is also a very valuable in autistic Centres and special needs schools. 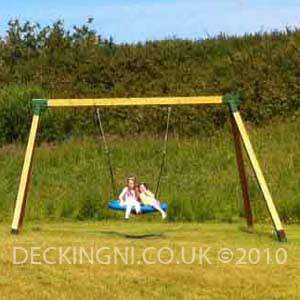 All swings need a large safety perimeter to maximise safety for all playground users. 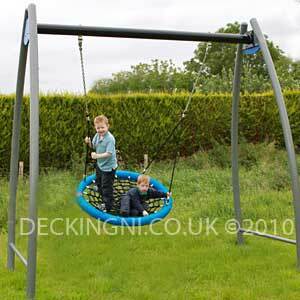 Info: Swings are great fun, Our metal Double Swing is very well designed, durable and complies with safety regulations BSEN1176. 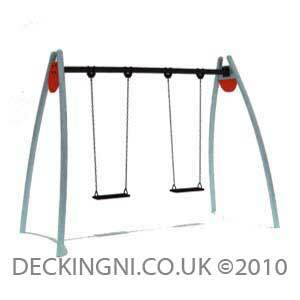 All swings need a large safety perimeter to maximise safety for all playground users. 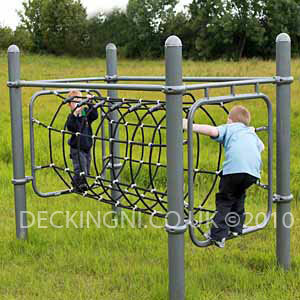 Info: The Arch Climbing Frame incorporates a plastic coated steel scramble net, horizontal ladder and horizontal bars. 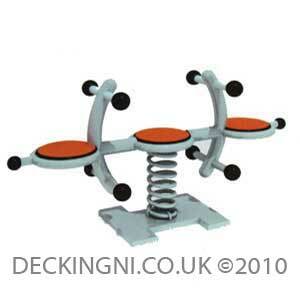 It can be used independently or as part of a fitness course or obstacle course. 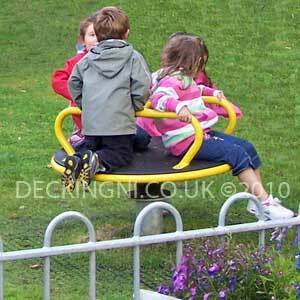 We also offer a smaller version of this popular commercial climbing frame : The Arch Climbing Frame 1200. Info: The Tunnel Net helps build co ordination, strength and self confidence as the child makes their way through the Tunnel Net. The Tunnel Net can be used independently or as part of an obstacle fitness course. Info: The Wobble bridge requires careful positioning of the feet to negotiate it. 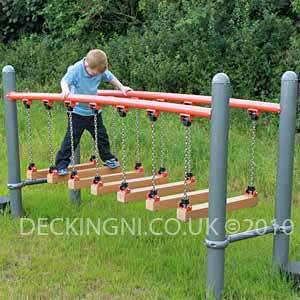 The moving rungs require that the child uses their arms to take a lot of their weight to negotiate this obstacle. The wobble Bridge builds strength, stamina and self belief. Info: The Traverse climbing frame is exceptionally well designed and made. It incorporates a traverse scramble net, a vertical ladder and vertical bars. It can accommodate up to 6 children at a time. 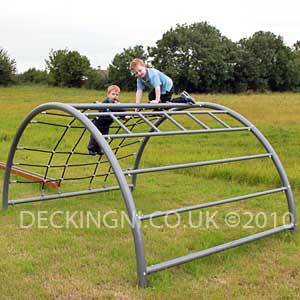 The Traverse Climbing Frame can be used independently or as part of an obstacle fitness course. Info: Use of this balance beam helps develop a good sense of balance. The anti slip surface reduces the chance of slipping. Many children can benefit from an improved sense balance. This can be particularly important for children with ASD. Info: Commercial play equipment. 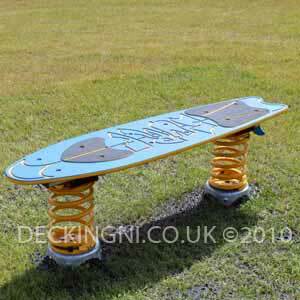 The Surfboard balancer help develop balance. It is colourful addition to any playground. Standng up and staying on the surfboard balancer takes a little skill to master and can be a great source of fun. Info: Commercial play equipment. The 3-Way Ball catcher can be used individually or for team games. The idea is that the child / children try to get the ball into the rose top. The ball can drop out through any on one of 3 ways in a random manner. Info: Horizontal Bars can assist in the development of upper body strength. The horizontal bars are useful for exercises such as pull ups. 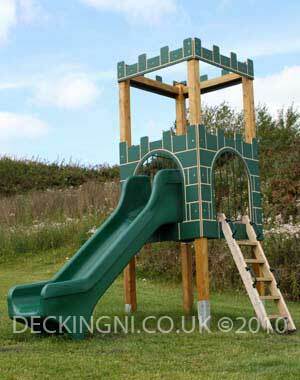 The set of three is designed to cater for children of various ages and heights. Horizontal bars are useful when used in conjunction with athletics, sports and gymnastics. Horizontal bars can be used independently or as part of an obstacle fitness course. Info: The Parallel Bars help develop upper body strength. The parallel bars are a very useful piece of apparatus for developing co-ordination, weight shifting and building self confidence. 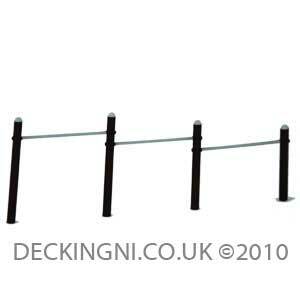 Parallel bars are useful when used in conjunction with athletics, sports and gymnastics. 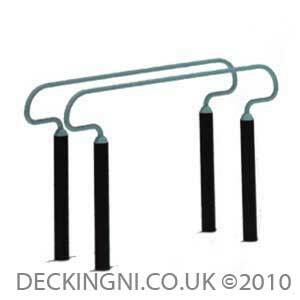 The parallel bars can be used independently or as part of an obstacle fitness course. Info: The Overhead Bars help develop upper body strength. The Overhead bars are a very useful piece of apparatus for developing co-ordination, strength, overall condition and building self confidence. 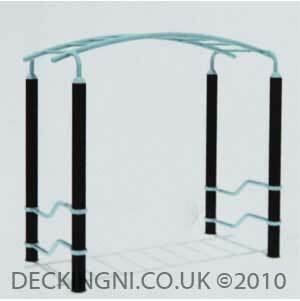 Overhead Bars are useful when used in conjunction with athletics, sports and gymnastics. 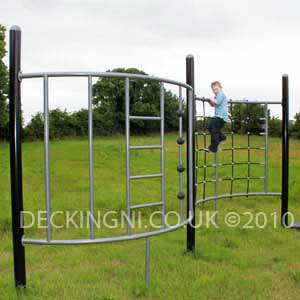 The overhead Bars or Monkey bars as they are sometimes known can be used independently or as part of an obstacle fitness course. Info: The spring Seesaw is a valuable piece of equipment for relatively little cost the rocking motion is fun, but also demonstrates cause and effect. 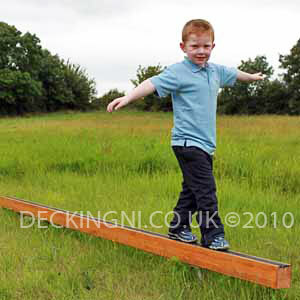 The see saw requires co-operation between the two children to enjoy. Info: The Park Disc Roundabout is a thrilling piece of play equipment. It rotates and tilts to an inclination of 5 degrees. Children generally lie across it or sit on it. The rocking motion is fun and multi directional. It also demonstrates cause and effect. 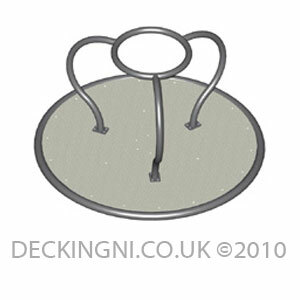 Info: The Twisting Disc is a small raised roundabout measuring only 700mm in diameter. Children generally lie across it or sit on it. The rotational movement is exciting. It also demonstrates cause and effect. Info: The stand on roundabout has a safety ring handle in the centre of the roundabout. Safety is of the utmost importance and the design restricts the roundabout to handle up to 3 children comfortably at any one time. Info: The Inclusive roundabout is designed in such a way that children in wheelchairs can easily slide from the wheelchair onto the roundabout. Safety is of the utmost importance and the design restricts the roundabout to handle up to 3 children comfortably at any one time. 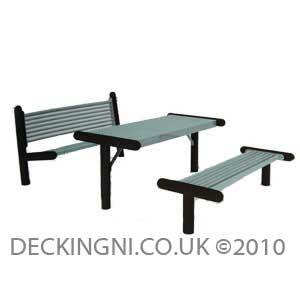 Info: This Vandal resistant, maintenance free Park furniture set is made from steel, It contains some recycled steel content . 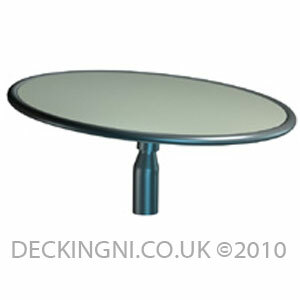 The steel is hot dip galvanised and plastic powder coated. The entire furniture set is fixed in concrete, The Park Furniture set is locked together with vandal proof stainless steel fixings. 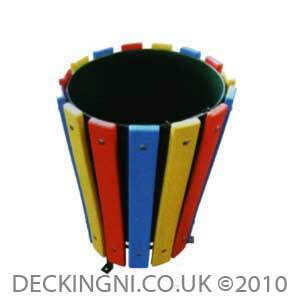 Info: This multicoloured Park bin is sheeted with coloured recycled plastic boards. 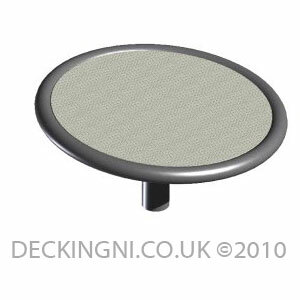 It adds a colourful dimension to any park or playground and helps children to locate the bin in the park or playground. The park bin assists in creating a positive experience for children when disposing of litter.